How often do you see a rainbow? In Pennsylvania I might catch sight of a rainbow now and then after a rainstorm. But it’s not an ordinary sight. For me, rainbows signify hope. They are light bending and dancing in a spectacular way. Why wouldn’t I want to bring that experience inside. Ever since I was a child and watched the movie Pollyanna with Hayley Mills, sun-catchers have had an important significance to me. They brought rainbows and hope into an elderly man’s and an orphan’s life through Pollyanna. Using prisms from light shades and chandeliers, Pollyanna strung them across a window. The sun shining through them made rainbows on the walls that were beautiful. I became familiar with prisms again when I hung a sun-catcher in the window and our cat began playing with the rainbows on the wall. I hung another sun-catcher. Then my husband and I visited Sedona on a research trip. In one of the shops, I found sun-catchers that were fashioned with round prisms and beads. Some of the sun-catchers include a piece of Sedona’s Red Rocks to bring positive vibrations into the house. 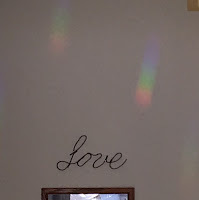 I strung a few across our kitchen window with a beautiful rainbow wall effect. 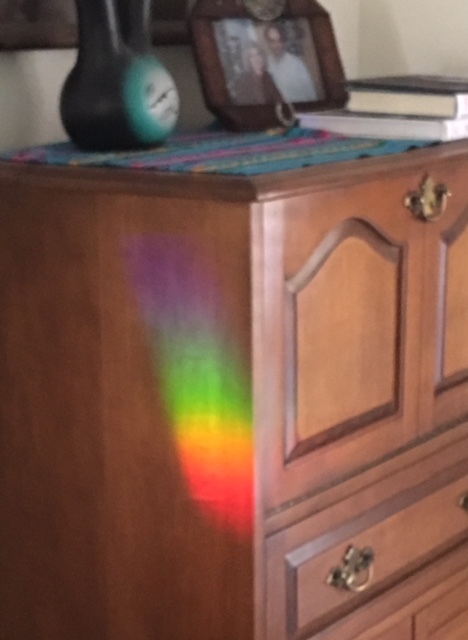 When the open window or the heat vent produces a breeze, the cats chase the rainbows on the walls that originate from the swinging prisms. Whenever I see a rainbow inside or outside, I smile. Rainbows are a precious part of life’s beauty.